Today, while driving to work, I took this photo. (click for larger image). The sign reads, "The world’s best crew works here". Whether or not you think that McDonald’s workers are the most talented individuals or they’re paid a fair wage is irrelevant. Take those issues and attitudes somewhere else. I love this sign. I think it is a step in the right direction in terms of employee relations. What is a better motivator, and display of gratitude for your staff, than letting everyone on a busy intersection know that this group of employees is exceptional. There is room for improvement though. 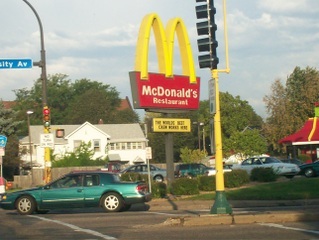 The other side of the sign read, "20 Piece Chicken McNuggets for $5.99".